Not to be confused with Suboccipital nerve. The lesser occipital nerve or small occipital nerve is a cutaneous spinal nerve arising between the second and third cervical vertebrae, along with the greater occipital nerve. It innervates the scalp in the lateral area of the head posterior to the ear. The lesser occipital nerve is one of the four cutaneous branches of the cervical plexus. 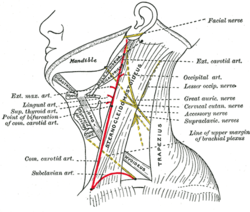 It arises from the lateral branch of the ventral ramus of the second cervical nerve, sometimes also from the third; it curves around and ascends along the posterior border of the Sternocleidomastoideus. Near the cranium it perforates the deep fascia, and is continued upward along the side of the head behind the auricula, supplying the skin and communicating with the greater occipital, the great auricular, and the posterior auricular branch of the facial. The smaller occipital varies in size, and is sometimes duplicated. It gives off an auricular branch, which supplies the skin of the upper and back part of the auricula, communicating with the mastoid branch of the great auricular. This branch is occasionally derived from the greater occipital nerve. Disorder in this nerve causes occipital neuralgia.